Jeff Britton’s drug store was at the southeast corner of Elm & Akard, so I think this is Elm Street looking east, with the trolley crossing Elm on Akard. I could be wrong! Suggestions welcome! Photo from the pages of The Bohemian magazine in the Fort Worth Public Library (the library has perforated its name into the image). What about the streetcar being on Elm and this view showing Akard looking north? This would imply we’re seeing the Britton drug store from the south, or rear. Would help a bunch to know where the big churches were in 1900. I hadn’t thought that we could be looking at the drugstore from the back. If that’s the case, wouldn’t the trolley be running on Main? If this view is Elm looking east, that little street just above the drugstore appears to run only to the right (south) and not the left, i.e. Stone Street. I’d do a bit more sleuthing, but the DMN archives are inaccessible at the moment. And my brain hurts from looking at this photograph for so long. I think this photo was taken from several floors up in the Oriental Hotel, which was on the southeast corner of the intersection of Commerce and Akard. Akard has an offset around the hotel where it crosses Commerce and from the hotel one could have seen straight up Akard to the north. The trolley is, I think, on Elm, and Main is seen across the middle of the photo. 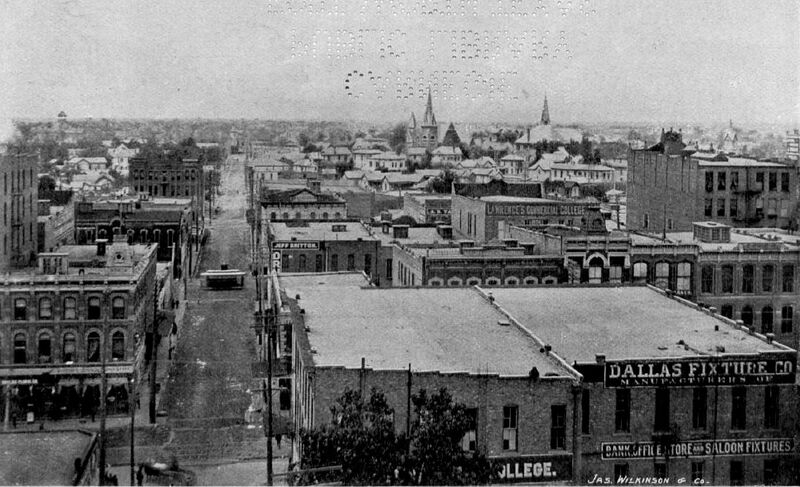 Nothing really of Commerce is visible because of cropping of the lower part of the image, and because there don’t seem to have been any very tall buildings on the north side of Commerce at this date to be seen facing the camera. This sounds like it could be right. I have another photo from the same photographer looking west down Commerce from about Akard — probably taken at the same time. But if Britton’s drugstore was at the southeast corner of Elm and Akard, the trolley has to be on Main. I’ll go ahead and post the other photo. You are right, Bob. The church at the top of the photo (the one in the middle) is First Baptist Church at Patterson & Ervay. I am posting a link to a map to show how everything lines up perfectly. Thanks for your help! I don’t think the street are empty. At that time it took a long exposure to capture an image so if people were moving around, they wouldn’t have made it into the picture that’s common in a lot of old photographs of city scenes.